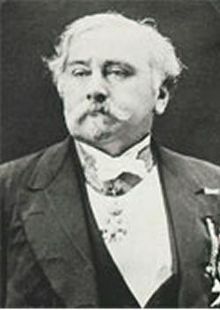 Alexandre-Emile Beguyer de Chancourtois was born on January 20, 1820 in Paris, France. At eighteen he began attending the school of mines at the Ecole Polytechnique. After completing his studies he joined a geological expedition to Turkey, Hungary, and Armenia. When he returned to Paris in 1848 he took a teaching position at the Ecole Nationale Superieure des Mines de Paris. He became a professor of geology in 1876. In 1875 he became the inspector of mines for France, a position he maintained until his death. As inspector of mines he introduced many safety measures including those to prevent a methane explosion. He is best remembered for being the first to organize chemical elements into a system based on chemical similarities. Using the atomic masses obtained by Stanislao Cannizzaro, he developed a table of sixteen units, the atomic mass of oxygen, that wrapped around a cylinder, like the thread of a screw. This system was not widely accepted by chemists because when it was originally published the printer did not understand the cylindrical system so there was no diagram printed and when it was later published in a geological journal it was ignored by chemists. The idea that chemical elements have periodic properties or chemical similarities as atomic mass increases eventually was developed by Dimitri Mendeleev into the first periodic table which was able to predict properties of yet undiscovered elements. The periodic table used today is based on that of Mendeleev. He died on November 14, 1886 in Paris. An interesting and neglected figure in the history of chemistry.